Sometimes you have to lose everything to find the one person who can save you. Former Marine Corps sniper Axe turned his back on everything he loved when he became the Sergeant-at-Arms for the Inferno MC. The fallen hero was determined to drown out the ghosts of war with an unrelenting path of self-destruction. He had no plans to set foot in his hometown of West Bend, Colorado ever again. Until the Inferno MC betrayed him. Now, there's nowhere left for him to run, except back to his father's ranch. Where he would come face to face with her. All she wants is peace and quiet, but when Axe shows up, he turns everything upside down. Can two broken and damaged people get a second chance at happiness? 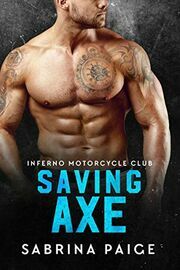 And when the Inferno MC commits the ultimate betrayal, will Axe's need for vengeance destroy his soul - or could June be his salvation? This is a STANDALONE full-length novel with a HEA and no cheating. The series can be read in any order, although you may want to start with book one, Taming Blaze, in order to understand the club dynamics.